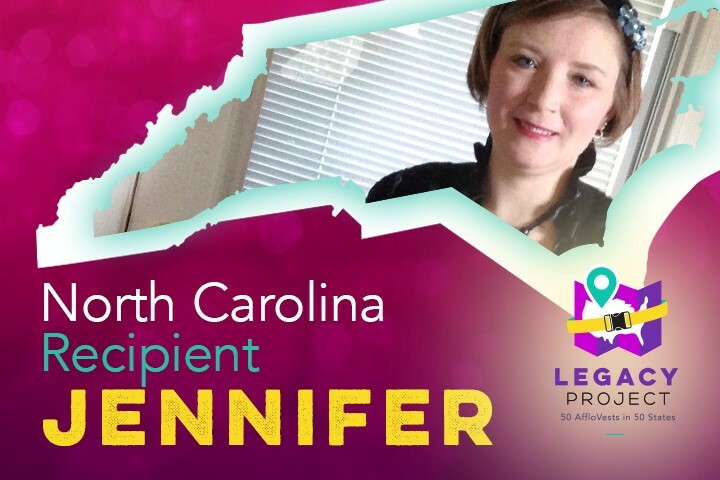 Jennifer was nominated by Rachael to be the North Carolina recipient of the AffloVest as part of the Legacy Project. She told her story of perseverance, accomplishment and positivity. And her timing was perfect - Jennifer had recently been denied a new airway clearance treatment vest and hers was more than 15 years old. “She fights and she is an inspiration to everyone around her, especially her 12-year old son who is her life,” said Rachael. “She has shown me and many others how to be a survivor!” In spite of her disease and having to travel for treatment, Jennifer earned a two year college degree, has a close family she loves and lives each day to the fullest. With her new AffloVest, Jennifer hopes to make her daily routines more family focused. From making breakfast for her son, to housework or even taking her dogs for a walk, the AffloVest will allow for more time to spend with the people she loves. Jennifer’s dad shared his gratitude for the improvements of technology and care that have helped Jennifer live fully. He shared the challenges, not only related to her physical health, but those related to frustration, anger and sadness related to living with and fighting CF every single day. While there were days when Jennifer would feel “done” with the disease, she kept fighting and today she values every moment she shares with her husband, son and extended family. Jennifer’s Legacy Day - courtesy of the charlotte hornets! Rachael wanted to help make Jennifer’s Legacy Day a surprise and convinced her that a couple of late Christmas presents were in store. The Legacy Foundation, in partnership with AffloVest and the Joyce Family Foundation helped Rachael give Jennifer and her family a fun day to remember. First, they were treated to some fun at a local water park and resort for some quality family time. Then the family showed up to the Charlotte Hornets for what Jennifer believed was a “meet and greet” with some of the players. Colton and the Legacy Project team surprised Jennifer with her new AffloVest AND some special treatment from the Hornets! She and her family enjoyed front row seats to a team warm-up, a special presentation of the AffloVest on the court, cheers from a stadium full of spectators and an evening in a suite to watch the game!